“This isn’t one of those scare-you-straight schools, is it?” I asked Ms. Vaughn, as we passed through the heavy chain-link gate. How could you not want to continue reading? Most books take a little bit for me to get in to as I try to figure out the characters, plot, and settings. This one had me glued from the git-go! Benson Fisher has won a scholarship to Maxfield Academy, which is good because he’s been having trouble staying steadily in a school since he keeps getting tossed and forth between foster families. The last family he was with turned him into slave labor so Maxfield was Benson’s chance to start life anew and in better circumstances. But as soon as he gets there (page 1) he instantly picks up on how wrong the school is. He can’t get out. There are no adults as the school is self-managed by the students who have broken up into three gangs. Cameras are everywhere and he is tracked by a GPS device. He is given some rules and breaking them can lead to being expelled – a thinly veiled metaphor for death. The tension mounts as Benson tries time and time again to try to figure out what is going on behind the school and to escape. Will he be able to figure out what is happening at the school? Can he find a way out? More importantly, will he even survive? There is a significant, game changing twist that is revealed halfway through the book -- something I didn’t see coming, anyways. It’s great, and it adds even more mystery to the setting the Robison Wells has created. It makes you wonder who Benson can and cannot trust. 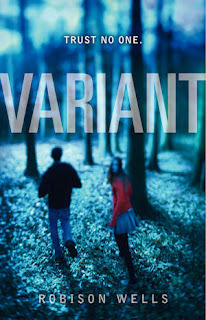 If you liked the Maze Runner then you’ll love Variant. I was surprised how much this reminded me of Maze Runner, though there are significant differences so this isn’t just a Maze Runner retelling. This also reminded me of Ender’s Game. Not so much because of the twists throughout the book, but because there is a strategy game with paintball that reminded me of the battle-school adventures in OSC’s masterpiece. And because everything is ran by children, there were also a lot of throwbacks to the classic Lord of the Flies. This book does end on a cliffhanger. I must admit, a stronger cliffhanger than I would like to see between books. But it leaves you wanting to see what comes next. I hope Robison is busily working away at this series. It seems to have the makings of a great three-part series. I liked your review James. It makes me want to get you to review my book lol. I loved Enders Game so I better pick this one up! it would be my next book to read. thanks for the review ! Hello James, I met you at the LTUE this week so I thought I would drop by and say Hello! Hey James Duckett, I met you at LTUE. I read Variant. I agree that the hook at the beginning was strong. I dont' know how I feel about the ending, but I suppose that will change once I read the second book.